Something a bit different from the usual road.cc offerings today. Frog Bikes is a new UK company that's producing a range of children's bikes, from the Tadpole balance bike to the Frog 73, with 26" wheels for older kids and teenagers. The bikes are numbered, rather than named. It looks a bit counter-intuitive until you realise that the number is simply an inside leg measurement. So sizing up your little ones is very straightforward: Stand them up against the wall, take their inside leg measurement and match it up with a bike. The number of the model is the minimum inside leg measurement for the bike. Easy. 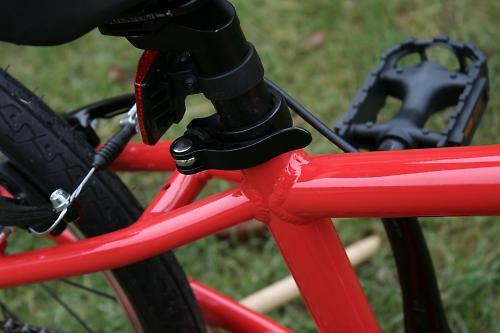 The bikes come with a decent length seatpost so they can grow with their rider. 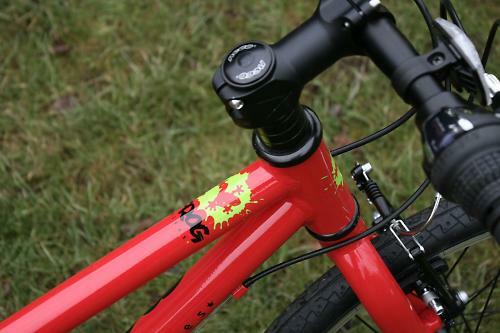 We've got a Frog 52 in for testing, which will generally fit 5-6 year olds. The thing you want most of all from a kid's bike is that the child enjoys riding it. You can't necessarily make them love cycling, but if they've got a bike that's fun to ride then that's a great start. The main thing that makes many bikes for little people awful to ride is the fact they're really, really heavy. Gas-pipe steel tubing, heavy wheels and tyres and bargain-bin components (including dreadful suspension forks) mean that some bikes for kids of this age can weigh 11 or 12kg. More than your good bike. More even than your town bike, possibly. No wonder they have to get off and push at the first sniff of a hill. Not so the Frog 52. It's got an alloy frame and fork, good quality kit, nicely built (but not overbuilt) wheels and sensible tryres that'll do for the BMX track or the towpath, though if you want to venture anywhere rougher you'll probably need to swap them out. The bike weighs in at 8.9kg, and those missing kilos will make all the difference to the feel of the bike. 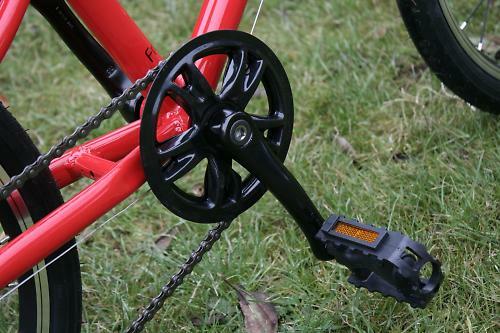 Gearing is courtesy of a 7-speed cassette and a RevoShift twist shifter which although it isn't the lightest of actions is certainly usable by small hands. 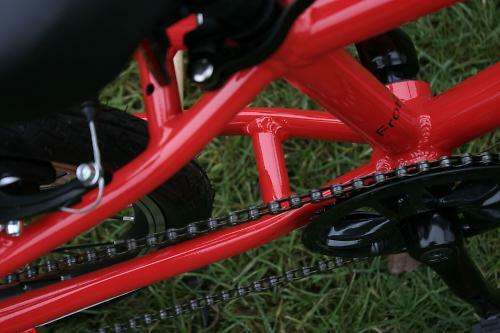 The 36T chainring and 11-28 cassette give a gear range of about 20" to 60" which is a sensible range for little legs. 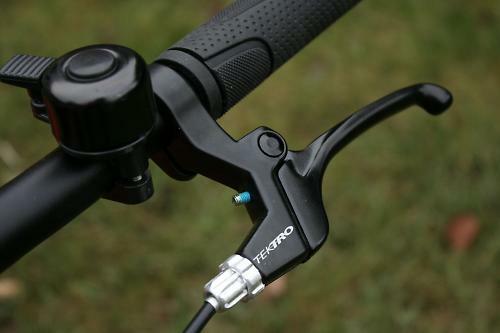 When it comes to stopping the Frog has Tektro linear pull brakes and, importantly, good quality reach-adjustable levers. The bike is quite long; that helps it to be a stable platform for learners and also means that there's plenty of reach to grow into, although at the bottom end of the bike's stated height range it's pretty stretched out. Comparisons with Islabikes are inevitable, so let's get that out of the way. It's a similar size to the Beinn 20 small which will set you back £299. The Frog 52 comes in at £245; the Shimano kit on the Frog isn't quite as high quality as the SRAM X4 shiftgear on the Islabike so in terms of value they're pretty comparable. We'd expect the well-built and well-specced Frog to hold its value in a similar way to an Islabike although possibly not to quite the same extent. That's enough talking: time to push the boy down a hill. Super Leg Power! Don't forget to brake!